Specifications Size: 10" x 6.5" + 5"
As a quality focused firm, we are engaged in offering a high quality range of Leather Sling Bag. 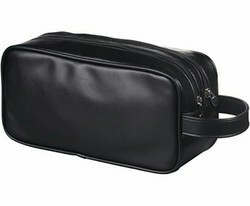 We offer a vast range of leather toilet bags/designer toilet bags, which is made of quality leather. These have a separate sections to keep products and are very durable. We can customize our large range as per the specific requirements of our clients. We offer it at an industry leading prices. We offer a vast range of toilet bags which is made of quality material. These have a separate sections to keep products and are very durable. We can customize our large range as per the specific requirements of our clients. We offer it at an industry leading prices. - Quantity Min 500 ps.